Sleep health is a very new field of study; it has only recently entered into the public conscience. Therefore both the clinical and patient populations lack knowledge about sleep health. As a result, clinicians in general are unsure about how to introduce sleep health and are not adequately addressing sleep health. In addition, there currently is a limited effort to prescribe the lifestyle approach to sleep. Yet clinicians should be comfortable incorporating sleep assessments and coaching techniques into practice. 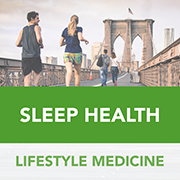 Incorporating sleep health assessment and intervention into practice is a key step toward practicing lifestyle medicine. Many sleep health strategies revolve around lifestyle changes of patients. Increased knowledge and competence in the practice of sleep medicine will enhance diagnosis and performance optimization for improved sleep health of patients.